Most of us know nothing about vitamins. What's more, what we think we know is harming both our personal nutrition and our national health. By focusing on vitamins at the expense of everything else, we ve become blind to the bigger picture: despite our belief that vitamins are an absolute good and the more of them, the better vitamins are actually small and surprisingly mysterious pieces of a much larger nutritional puzzle. 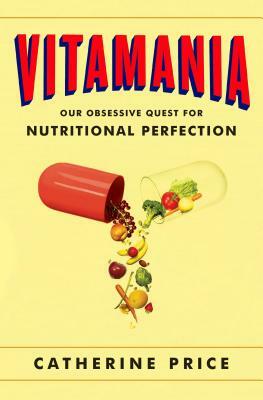 In Vitamania, award-winning journalist Catherine Price offers a lucid and lively journey through our cherished yet misguided beliefs about vitamins, and reveals a straightforward, blessedly anxiety-free path to enjoyable eating and good health. When vitamins were discovered a mere century ago, they changed the destiny of the human species by preventing and curing many terrifying diseases. Yet it wasn t long before vitamins spread from labs of scientists into the realm of food marketers and began to take on a life of their own. By the end of the Second World War, vitamins were available in forms never before seen in nature vitamin gum, vitamin doughnuts, even vitamin beer and their success showed food manufacturers that adding synthetic vitamins to otherwise nutritionally empty products could convince consumers that they were healthy. The era of vitamania, as one 1940s journalist called it, had begun. Though we ve gained much from our embrace of vitamins, what we ve lost is a crucial sense of perspective. Vitamins may be essential to our lives, but they are not the only important substances in food. By buying into a century of hype and advertising, we have accepted the false idea that particular dietary chemicals can be used as shortcuts to health whether they be antioxidants or omega-3s or, yes, vitamins. And it's our vitamin-inspired desire for effortless shortcuts that created today's dietary supplement industry, a veritable Wild West of overpromising miracle substances that can be legally sold without any proof that they are effective or safe. For the countless individuals seeking to maximize their health and who consider vitamins to be the keys to well-being, Price's Vitamania will be a game-changing look into the roots of America's ongoing nutritional confusion. Her travels to vitamin manufacturers and food laboratories and military testing kitchens along with her deep dive into the history of nutritional science provide a witty and dynamic narrative arc that binds Vitamania together. The result is a page-turning exploration of the history, science, hype, and future of nutrition. And her ultimate message is both inspiring and straightforward: given all that we don t know about vitamins and nutrition, the best way to decide what to eat is to stop obsessing and simply embrace this uncertainty head-on. By exposing our extraordinary psychological relationship with vitamins and challenging us to question our beliefs, Vitamania won t just change the way we think about vitamins. It will change the way we think about food. "A hidden, many-faceted, and urgent story." "The baselessness of our hopes for various elixirs, alongside our baseless fear of science's true achievements, opens up a rich vein of hypocrisy that Ms. Price mines with engaging relish." CATHERINE PRICE is an award-winning journalist whose work has appeared in publications including The Best American Science Writing, the New York Times, Popular Science, O: The Oprah Magazine, the Los Angeles Times, the San Francisco Chronicle, the Washington Post Magazine, Salon, Slate, Men s Journal, PARADE Magazine, Health Magazine, and Outside. www.catherine-price.com@catherine_price"